Salma and Zameel met at university and were together for seven years before a marriage proposal cemented their relationship. The proposal happened unexpectedly. Zameel, a medical student, was in Vancouver for the Christmas holidays. On Wednesday, December 21, he had made plans to take Salma for lunch at one of their special date restaurants, Taki's Tavern. Then another couple was going to join them to go up to Grouse Mountain for the first time and go skating. After a nice late lunch, Zameel's friend called to say they wouldn't be able to make it up to Grouse Mountain. So Salma and Zameel headed up themselves. As the sun set and the Vancouver rain began to drizzle, the couple went up on the gondola to the top of the mountain. They got off the gondola and it was a beautiful sight with Christmas lights and decorations. After a windy, shaky gondola ride down the mountain, the couple got into the car and headed downtown. Salma fell asleep and when she woke, Zameel was on the phone, trying to figure out where to park. They were meeting a friend who worked at the Opus Hotel in Yaletown. All the parking in the vicinity of the hotel was full, so they used the valet and headed inside. The elevators were locked, their friend called down to let his guests up to the penthouse. As Zameel and Salma got out of the elevator, their friend came rushing towards them. His car was about to be towed away, so he had to go move it. He gave Zameel the room key and promised to be back soon. Zameel opened the door to the room. Inside it was dark except for candles that illuminated the entire room. Salma looked at Zameel questioningly. He told her to follow the path. Salma looked down, and there was a path on the floor made with hundreds of colorful chocolate kisses. With her heart pounding, Salma began to follow the path. Along the way were not only candles, but also photographs. The first was a picture of Salma as a baby and then Zameel as a baby. Then a picture of them as toddlers and so on. As Salma followed the path of kisses, she turned the corner around the fireplace and there was a bed covered in rose petals with two long-stemmed roses on the pillows. At the edge of the bed were tealight candles arranged in a heart shape, with arrows pointing the direction to follow. Salma continued walking, following the chocolate kisses, candles, and photos. The path ended in the bathroom in front of a large shower. The shower floor was completely covered in red rose petals, lined with glowing candles, and at the end was a square black ottoman. The ottoman was covered in rose petals, two more long-stemmed roses, and large, framed picture of the couple. On top of the roses was a letter and Salma picked it up and began to read. "Dear Salma, We've feasted to our delight at a restaurant we call our own. We've skated at the top of the world. Know that I kiss the ground you walk on, and I'll always shower you with roses. I know we will both cherish this moment forever, for tonight is a night when we become one soul from two. Now turn around and follow the kisses back to me because I have a very important question to ask you. Yours forever, Zameel." With tears streaming down her face, Salma walked back to Zameel. He took her hand and spoke beautiful words of their love and their life. Then Zameel took out the ring, got down on one knee, and said, "Salma Amin Dinani, will you marry me?" So overcome with emotion, all Salma could do was nod her head to say yes, yes, yes! And then, as soon as Salma was able to speak, she wanted to know every detail: how he had arranged everything, how he had kept it a secret, who knew, and so on. Zameel patiently told her everything. Then, as Zameel had prepared in advance, dinner was sent up to the room. But that wasn't the end of it. Zameel had also made a game for them to play. There was an envelope full of questions about the couple and their individual lives. Each time Salma got a question right, she would get to put her hand in a bag and take out a few puzzle pieces. If she got enough questions correct, she would be able to complete the puzzle, which was six photographs of the couple that Zameel had put into a puzzle! Salma and Zemeel are Ismaili Muslims so they married in accordance with their traditions, which include getting married at jamat khana (mosque) by the leaders of theirjamat. “We wanted a traditional location but we also wanted to be connected with the outdoors. So we held the ceremony at the mosque but organized it outside in the courtyard. The Vancouver wedding reception of choice was the Radisson Hotel Richmdon because it was practical and it could accommodate all 300 guests. The bride wore a white sari to the ceremony which is the tradition, then a white wedding dress to the reception. The groom wore a traditional black Indian suit to the ceremony and a black tuxedo to the ceremony. The family helped with the centerpieces and the groom’s aunt made the flower arrangements and decorated the cake. The groom's parents hired a catering company to make sandwiches and sherbet for the afternoon after the ceremony, and we had Chairs with Flair put chair covers and bows at the reception explains Salma. Salma and her bridal party entered to the Beverly Hills Cop theme song in a fun fashion-show entrance. Zameel surprised Salma with a serenade of the song "I Want to Grow Old With You" from the movie The Wedding Singer. The groom's mother surprised the couple with décor for the reception that made the courtyard look a little like the outdoors, including an original Monet backdrop. Atish Ram Media prepared an amazing slideshow of pre-wedding and wedding pictures, a video interview, and musical theme songs. The couple surprised everyone with their first dance, which started out with a slow song and then switched to a fast salsa. We wish Salma and Zameer a lifetime of happiness together. Thanks for sharing your details. On rakri, take a moment to celebrate your brother, sister or anyone that's close and dear to you that has made you realize your greatness by loving you for exactly who you are! Happy Rakhri. This week, we're featuring the beautiful Ismaili Muslim Wedding of Salma & Zameel. I love the softness and freshness of her overall look (definitely not over processed which seems to have become a trend these days but I'll save that for another blog). A bit of background about Salma. She was a host has interviewed me several times on Zindagi TV. For those of you who are not from the greater Vancouver - Zindagi TV is a popular lisfestyle program geared at to the South Asian Community in Vancouver. 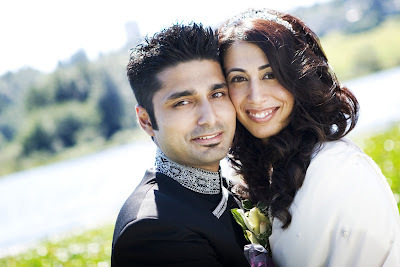 Atish Ram is not only the producer of Zindagi TV but also a Vancouver wedding photographer who gracefully documented their wedding story. Salma had a pretty amazing proposal story which I will be posting later this week. But for now kudos to Zameel and his superior planning skills that made Salma's proposal so memorable. I'll be updating her story later this week but for now enjoy some of the beautiful shots.